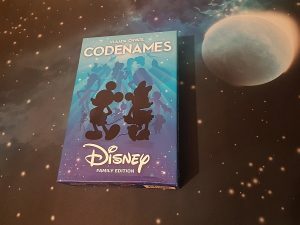 This version of Codenames is a masterpiece, not only can you still play a great game, but also use either the picture side or the word side of the tiles with an appeal that only Disney can give. 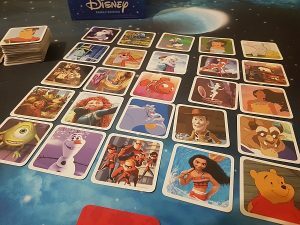 Whether you remember the classics like Dumbo or Bambi or are into the more modern Frozen or Momoa or the Pixar classics like Bugs life or Toy Story or even all of the above, there is so much here to spark pleasant memories that crosses the generations. 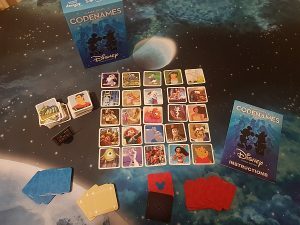 You have two teams, one red and one blue, each team has a clue master (not a spy master as in the original as this is more of a lighter family game) The tiles with the Disney pictures or names side up in either a 4×4 grid for easier mode or 5×5 grid for advanced mode. The rest of their teams are opposite them, the key card is in front of the clue masters so that they can see which tiles are their teams which are their opponents, which are neutral and in advanced mode, which is the game over tile. The clue master will give a clue for their team to guess which tiles are their teams colour. The clue can be for one or more tiles, the clue is one word and then a number to tell their team how many tiles the clue relates too. The team who guesses all their tiles first without choosing the game over tile wins.